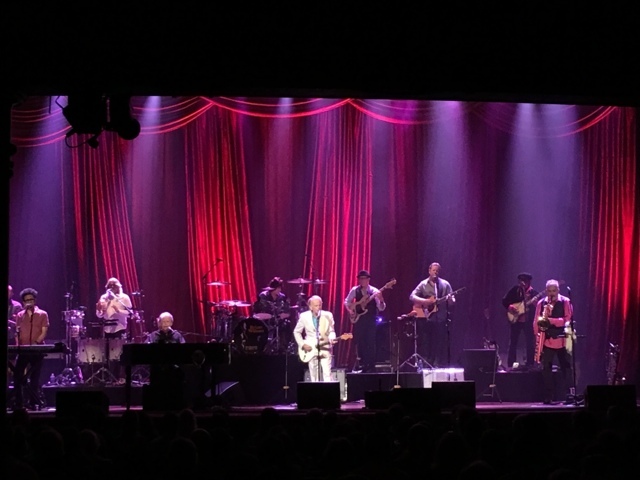 Brian Wilson, formerly of the Beach Boys, fulfilled a two-night residency at the Ryman Auditorium " which concluded on Saturday night..
Wilson and his band performed numerous Beach Boys classics along with the legendary album "Pet Sounds in its entirety. The band opened with a beautiful, crowd-endearing rendition of "California Girls," after which the audience roared with applause. Brian's verbal antics had the audience laughing in admiration of the songwriting legend and founding Beach Boy. He continually spoke to the audience, introducing each song with charisma. "Ladies and gentleman, please be seated!" was perhaps Wilson's favorite catchphrase of the evening. He received several standing ovations after several songs' completion, but Wilson was there to perform, not to be applauded. Before the song "Salt Lake City," Al Jardine, fellow founding Beach Boy, shared that he and Brian had written the song about a fair they used to play in their youth, but Brian was quick to correct Al in saying, "Here's a song that I wrote!" as Wilson kept into the intro of the song. Jardine's son, Matt Jardine, came forward early in the show's first set to deliver a hauling rendition of "Don't Worry Baby," channeling the falsetto voicing of the original 1964 record.He was met with a standing ovation and screaming applause for his resurrection of one of the most beloved Beach Boys' songs of the "surf" era. Blondie Chapin, former Beach Boys and Rolling Stones collaborator in his own right, joined the band for "Sail Away, "Wild Honey," and "Sail On Sailor," delivering two memorable (but loud) guitar solos in the later two songs. After an intermission, the band returned and delivered what was promised: a performance of the classic 1966 album, "Pet Sounds," in its entirety, 50 years later. The band performed "Pet Sounds" in its original sequential order, with Brian at the helm for vocals. "Wouldn't It Be Nice" kicked off a crowd sing along, with Matt Jardine's beautiful falsetto carrying the song. As the second half of the show progressed, Wilson spoke (and occasionally shouted) his vocals more than singing, which the audience had mixed reactions to. For those unfamiliar with Wilson, he has suffered under intense mental illness for the better part of his life, and at the age of 74, one can hear the liveliness in his speaking voice, but the taxation on his singing voice. His hunger to perform outweighs his handicaps, and the passion and soulfulness in his deliveries make for a memorable experience for all in attendance. In seeing Wilson, it's not about the performance, it's about the experience. Still, Wilson's band has mastered the art of capturing the magic of the original Beach a boys records and reproducing the sounds of the surf rock era in a way that transports you out of your seat and onto the Santa Monica Pier, 50 years ago. After the completion of the "Pet Sounds" portion, the band exited the stage, and returned for an encore, where they shifted it into gear with Beach Boys classics like "Surfin' U.S.A.," "Help Me, Rhonda," "Fun, Fun, Fun," and "Barbara Ann"
The evening came to a close with a sweet, tender rendition of Brian's spiritual song, "Love and Mercy." Brian Wilson and his band had the crowd singing and dancing all night, and the audience could not get enough of their performance. If one thing is for certain, the 60's were alive and well at the Ryman on Saturday night, and we have Wilson, Jardine, and the rest of the band to thank.